SS Dante, San Andreas and Diamond Star were the winners at the Australian New South Wales regional Young Horse Championship held at the 2012 CDI Sydney on 4 - 6 May 2012. 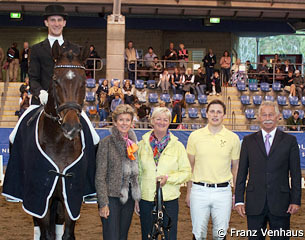 The young horse classes were judged by Stephen Clarke (GBR), Peter Holler (GER), and Susan Hoevenaars (AUS), while German Andreas Schoeffner was a guest judge rider at this event. Guest Rider Schoeffner rode 4 finalists in the 4 year old class, with the standout winner being the gelding SS Dante. He is an Australian bred Hanoverian by the imported stallion Welfenadel out of the imported Oldenburg mare Donna Carina, which herself was Champion of Champions in 2005 at DJWTS and represented Australia at the World Young Horse Championships. Dante was bred by Andrea Beatty from Saffron Stables in NSW and is owned by Andrea. He was beautifully ridden and presented by Rodney Martin from NSW. His standout pace was the walk; huge overtrack and clear rhythm shown to the judges in both medium and free walk. The canter was uphill and forward and the trot rhythmical and correct. The judges commented on the correct confirmation of the horse which allowed him to show his correct paces and enhance his ability to spring up and over the ground. The 5 year old winner San Andreas, was the judges standout favourite for the day. He is a German bred Hanoverian gelding by Bundeschampion and World Young Horse Champion Sandro Hit out of a Walt Disney mare. He is owned by Linda and Beau Dowsett from Queensland and ridden by Jayden Brown with great tact and ability. This horse showed huge natural ability, super hock action rhythm and spring. The canter transitions were smooth and he impressed the test rider with his suppleness and spring over the back. Walk was correct with a clear overtrack. The judges described him as a huge potential horse for the future. Jayden Brown was thrilled with the result. "I knew he had the potential to do well. We were hoping for a top five so we're obviously ecstatic with the result. He certainly over delivered as far as our expectations are concerned." The 6 year old winner Diamond Star is an imported German Barvarian by the Oldenburg Reserve World Young Horse Champion Diamond Hit out of Parole D'Honneur (by Pour Plaisir). He was bred in Germany by Ramsbrock Stables, Schnell and is owned by Vicki Newham. Diamond Star was ridden by Judy Dierks. This horse showed great rideability and cooperation with the test rider. He showed three correct paces and in the canter the flying changes were excellent. The judges made special mention of the qualities of the horses Jaybee Allstar (Peta Cormack) and Don De Sandro (Matthew Dowsley) as both of these had shown some excellent work. The judges’ decision was not easy but the overall winner had to be Diamond Star because of his quality in all three paces. The judge from Great Britian Stephen Clarke (who will be chairman of the judges at the 2012 Olympics in London) praised test rider Andreas Schoeffner for his ability and tact in riding all these young horses. He particularly commented on the way Andreas would ride the horses forward, gain their trust, reward them and then ask them to show their paces. The 2012 young horse competition presented all with many excellent horses and great hope for the future of Australian Dressage.